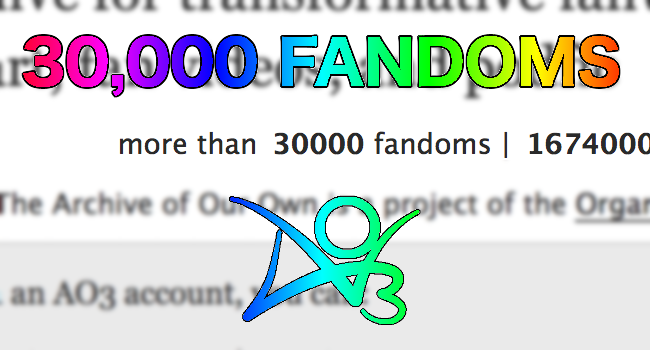 Tag Wranglers are pleased to announce that we have reached the milestone of 30,000 fandoms on Archive of Our Own – AO3 ! This comes shortly after we celebrated reaching 4 million fanworks in July. Are there any rare fandoms you love that you discovered on AO3? With so many new fandoms, fanworks, and users joining us daily, now is a good time to explain what this growth can mean for users and Tag Wranglers. Tags on AO3 are shared. If you use the same exact tag that someone else has used, your works will be included in the same filters. Tag Wranglers cannot separate works using the exact same tag. We can only wrangle tags, not works. If you discover that your work is showing up under a different filter (tag) than you intended, you can edit the tag on your work to be clearer. For example, Penny Parker is a character on the TV show MacGyver. “Penny Parker” is also a common fan name for female Peter Parker, better known as Spider-Man. If you tag your work “Penny Parker”, it will end up in the filters for the MacGyver character, even if you were thinking of female Peter. To avoid this, you could alter your tag to “Penny Parker (girl!Peter)” or something similar. That would allow Tag Wranglers to merge it into Peter Parker’s tag filter instead. If a tag is new to you, you might find it useful to check its filter before using it. You might find that the tag has a different meaning in a different fandom. From January through September this year, Tag Wranglers collectively wrangled approximately 1.8 million tags. Tag Wranglers work very hard to connect your tags; you can make our job easier by being clear about what you mean. Autocomplete is your friend: If a fandom tag exists in the autocomplete for your fandom already, try including that tag. The tags that Tag Wranglers see are based on filterable fandoms listed on the work, so using a fandom tag from the autocomplete speeds up the time it takes to wrangle your tag and have it show up correctly. Making a new fandom: If there is no fandom tag yet for your work, try including the medium, creator, or year the canon was first published in the tag. This speeds up the process of creating a new fandom tag, as we will have more information to use when researching what canon you mean! For books, it’s especially important to include the author’s name; for movies, the year. For other fandoms, usually the media type is enough, unless the title is very generic. For example, if you’re posting for the TV show “Merlí”, try adding “TV” after the title, like this: Merlí (TV). Be kind to RPF fans: Try to avoid mixing up Actor RPF and fictional TV or movie fandoms in your tags. If you’re posting Actor RPF, please use the RPF fandom tags. If an RPF fandom tag doesn’t exist yet for that TV show or movie, make one by adding “RPF” to the end of the TV show or movie’s existing tag name. Example: The Hunger Games (Movies) RPF. Please also try to avoid using the Actor RPF fandom tags if you’re only working with fictional characters. This will help RPF fans easily find the works they want and will reduce the effort Tag Wranglers must use to find the right place for your tags. Make characters unique: Try to use full names for characters. If a character has just one name, put the name of the fandom in parentheses after it. Example: Undyne (Undertale). This especially helps avoid any potential ambiguity issues and ensures that it will be easier to find your work. You may not think the chances of having a character named Undyne in another fandom is high, but this happens frequently. Separate your / and & ships / is for romantic and/or sexual relationships. & is for platonic relationships only – ones that are neither sexual nor romantic. (Pre- and Post-Relationship are still /.) & was created for those Gen fans who don’t want anything non-platonic in the ships they’re searching for. You can help both Gen fans and shippers by carefully choosing the tag that matches your work! Add cameos in the Additional Tags field: If a fandom, character, or relationship is only a passing reference, you can choose to put the tag in the “Additional Tags” (Freeforms) category instead. This will keep your work from being sorted into the fandom, character, or relationship’s filter, while still telling users what’s in the work. Example: Hints of Jin Dong/Wang Kai in the “Additional Tags” field keeps Jin Dong/Wang Kai fans from being disappointed that a work only mentions their relationship briefly. These suggestions are meant to help get your tags wrangled quicker and more accurately so that users have a great experience on AO3. You won’t need to edit any tags on past works or bookmarks unless they aren’t showing up in the filters you prefer. However, these tagging suggestions don’t mean that you can’t continue to tag creatively for various topics! Tag Wranglers love clever tags, and sometimes we can even canonize the concepts. Magneto’s Terrible Fashion Sense is just one of many enjoyable tags that make us giggle. If you have any questions or suggestions about wrangling, please consult the Tags FAQ. If that doesn’t answer your question, the FAQ explains how to contact Tag Wranglers directly, or you can send short questions to us at our twitter account, ao3_wranglers. Please don’t leave comments on this post with questions or requests about specific tags. They won’t be answered, since Tag Wranglers can’t easily track requests from here. Please use the options listed above to contact us. Thanks! Definitely will come to use someday. I just requested an account two days ago, and can’t wait for the e-mail to get here!